Currently, over 40% of American wives out-earn their husbands and the existing income gap is expected to be wholly flipped by 2028, a startling statistic given the familiar standard structure of 20th Century American families. 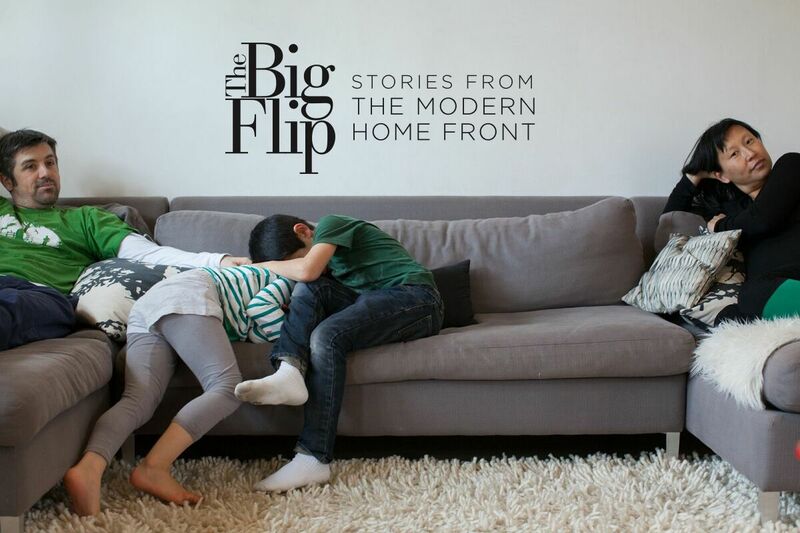 The Big Flip is certainly a fitting label for this transition and it also happens to be the title of a new documentary from Director and Producer Izzy Chan. Chan uses her documentary to document the lives of four families who have found themselves participating in this increasingly typical financial family structure. I had a chance to speak to Chan and her Photographer-in-Chief Paige Green about their intentions, motivations, and experience making the film. Teaira Lacson [AE]: Can you explain your interest in this topic? Is it something you are personally familiar with? Izzy: For me, it is also a personal thing. I call myself the “accidental breadwinner” for a few years. That’s because my husband was out of a job unexpectedly, which is another way couples fall into and enter “The Big Flip.” I actually come from a strategy and research background. Paige comes from a photography background. From a career standpoint, I have always done research and looked at data points. When I started living “The Big Flip” myself, I started having issues. Even without kids, I think my husband and I were having a lot of friction and tension because of the flip, where I ended up carrying more of the financial load and started to resent why the housework wasn’t being taken up more by him. We ended up having a lot of arguments. When I dug into the research, that’s when I realized I wasn’t the only one and that what I was feeling and what he was feeling was sadly representative of the general crowd out there that was going through it. When I look at the numbers, one of the most startling things is divorce is 40% more likely in Big Flip marriages—that kind of threw me off and made me upset. That’s when I realized I was not willing to concede that our marriage is over. I love my husband. I don’t have the stories of how other people are doing it: What are the best practices? What are common mistakes? How do we encourage each other and find a better way to resolve the friction that tends to occur in these family situations? That’s when I approached Paige and said, “We need to do a documentary.” I don’t want to look at statistics. I don’t want to stop there. I want to see how people are doing it and learn from that. [AE]: As families who have personally endured the Big Flip, how did your own friends and family react to your decision to become the breadwinners? Paige: It wasn’t really a decision. It just sort of happened that way. Based on what I do as a photographer, I make more money than my husband. It’s how our roles fell; it wasn’t really conscious. As far as my family, my family thinks I’m crazy for living in California anyway, growing up in the southeast. They’re proud of me and my family. My grandfather says we’ll probably never be millionaires, but we’re living a good life. I’ve had a lot of support. Izzy: From my side, especially without kids, it’s one of those things I call “a hidden trend” because unless it’s obvious, you don’t talk about it. You might know the women are working or the men are doing a job that’s like a musician or in the music studio—my husband was doing that for a while. While you think harder about it, you may realize there is a financial difference. It doesn’t come out naturally in general, social conversations. During my time as the breadwinner, we were–I don’t know how much of it was projected by ourselves and how much of it is pressure of those around us–uncomfortable around the topic. What does Aaron do? When he finally found a music studio job, we could say that, even though it hardly brought in any income. It helped to prevent anything uncomfortable. After starting and working on the film, my husband and I are one of those couples that ended up over the course of the past five years asking, did the flip, flop? He finally got a job where he slowly caught back up on his income. We started becoming even and in the last year, because of the documentary, I have actually done less paying work; it’s fulfilling but not paying work. He now is taking the lead in the finances of the family. He’s been supportive to help me finish this film. I find myself, when I meet his new coworkers who look up to him in his senior position and they talk about what they do, I tell them about the film. They ask, exactly what you just asked, “What inspired you to make this film?” I still feel uncomfortable. I’m not sure how to talk about it and how it will reflect on him, especially to his coworkers. They look to him as someone who is a senior person in the company, and I suddenly go into this time when he couldn’t get a job. I had to carry the load and how there was a lot of friction in our marriage. I know that it’s something that I’m sensitive to, and I really look around the see who’s in the room. Is his boss there or are his clients there? We don’t know how people will receive it, how it might reflect on him, and how he feels about it having the spotlight put on him in that fashion. [AE]: In one scene in the film, there is a group of breadwinner women having a luncheon where they can chat with women in similar situations. Did you two find yourselves engaging more frequently to one another? Because, Paige, you mentioned how you didn’t really have anyone to discuss what was happening. Paige: Yes, definitely. 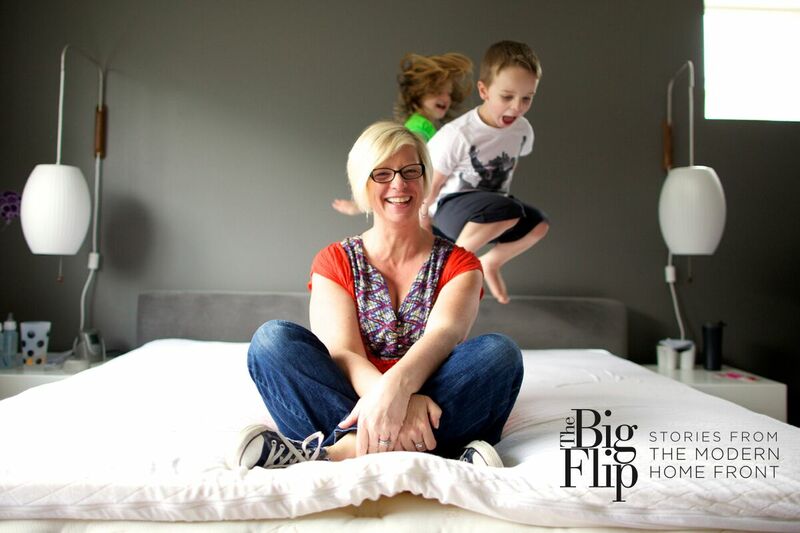 Since The Big Flip project, I find myself having conversations about it all the time and extremely helpful. I love hearing both perspectives from men and women, about their lives and how they make it work, the challenges they face. Izzy: We connected on many levels. One of many things, we are both creative people. Paige is a documentary photographer. I come from a more video background. There were so many things we connected on. That is definitely one of them and one of the things that I could personally talk with Paige, because I was there when she was pregnant with her first child, had her first child, and pregnant with her second child. I could see how passionate she was about her family and continues to be passionate about her craft and art. It’s important for women to see other women who love their families who, even at the same time, are not sacrificing their craft and finding a way to do the two. Part of the connection we had was being fully committed to our craft, but at the same time still being human, being good moms and good wives. I think that’s something we have in common. [AE]: Getting to the families of The Big Flip: from what I’ve read you were intention in casting blue-collared families. What other criteria did you believe the family had to meet in order to represent the working class family? Izzy: We made sure to get a range. We had some blue-collared families. One or two of the families was a little better off. We didn’t have any families that were mega-rich, because I think that’s a whole other story and has its own problems trying to cast. We wanted to cast a range so that when people watch this, they will see this is truly the American fabric across the different classes, places, and background. [AE]: Did you find you had more luck with the coastal states than the inner states? One may argue if you, go towards the middle of the U.S. you get into the more traditional family structures. Izzy: We had more difficulties, definitely, going into the central states and more difficulties with families who were having more trouble. Those families exist. If you look at the statistics, this is something that is happening across blue states and red states. However, getting someone to agree, to have a camera crew come in and be part of your life on and off for a year and a half, that’s what stops people from outside of the coast. We would get emails from people from all over, especially when we did our Kickstarter. Emails from all over and sharing their stories but then saying they could not be a part of the film. I think the cultural expectations and more traditional in views of those families in the central states are a little less comfortable in having a camera crew being a part of their lives. [AE]:While the movie is very much about a large culture shift, it is also a very personal collection of character studies. Did you expect a movie about such a specific phenomenon would become such an intimate exercise? Izzy: We wanted, from the get go, that while we’re documenting this big trend and with my background in storytelling and filmmaking, you’ve got to get people to care first. We did not want to do, what I call, a propaganda movie, an activist documentary that’s only talking to people who share the same views and just reinforce them. We are trying to get people to care about these families as individuals, and get to walk in their shoes and go through what they’re doing. I think it’s the best way to get a broader demographic to be interested and drawn into topics. I’m glad to hear you say that. From the get go, we’ve been trying to balance how do we address the issue, from an informational and educational perspective but not be didactic and not so propaganda that we’re no longer being good storytellers in engaging people. Paige: Everything you said is true. They’re real personalities and who they are. It is very personal and sometimes uncomfortable to be in those scenes and documenting, but we wanted to tell the real, uncensored story. I did believe it was going to get personal. [AE]: The repeated mantra of your film is “How can love endure?” It’s been a while since you’ve stopped filming, the couples were from different interpersonal states in the last chapter of the movie, did love endure? And why did you think it did? Paige: I definitely think love endured. Originally when we had started the documentary, I was not sure how much would change for families within a year. I was shocked that they had so much change. Partly, it’s a nature of where these families are in the spectrum of life. They had great changes and a lot of adversity. They are all very committed. It was great we saw the honesty of the relationships, which was more difficult, but they were working it out and navigating through the Big Flip, this social change, but love did endure. Like Izzy was saying, when she was faced with these statistics, she wanted to show something else or start a conversation. This was more than a statistic—how and what are families doing to overcome these odds and challenges. We personally have experienced it in Izzy’s family and my family. Izzy: I second that. Love can endure. I don’t want to present anything; hopefully you’ve seen the end of the film. It’s not that all roses and rainbows and unicorns and easy, it’s not. There are challenges. There are friction points. But they can be overcome. With understanding and a willingness to explore, some of this is our own internal biases and expectations, to challenging ourselves, to listening and communicating and figuring it out with our partners, we can make it work. We can start changing those statistics and turning that higher divorce rate down. Hopefully, the making of this film and sharing it with folks who are doing this, we are going to help them get inspiration and tools to figure out to make love endure in their families as well. [AE]: Each of families was from larger U.S. cities, with the exception of Jenny Garrett’s family. Instead of primarily focusing on major landmarks, you relied on creating the vibe of each city. For example, Portland’s free-spiritedness and Seattle’s gloom. Why did you decide to approach it in this style? Paige: We were focusing on where the families were and what made sense to the family. For instance, Ross and Julie in L.A., we picked areas where they were living. It didn’t make sense to go outside of their circle, but we did still want to capture things that were part of the story of their lives instead of the landmarks and really pick a part of the city that would give a sense of place and connect the family. [AE]: You capture some pretty effectively personal portraits of these families in a rather candid, everyday life. How hard was it to get so much successful footage without it being invasive to the families? Paige: When you’re hiding in a corner or sitting on the floor, especially families with kids, they move on. They pay attention to you for a little bit, but then they move on. That’s what we want. We ended up having good relationships with the families and we enjoyed each other, there was some difficulty in trying to get them to ignore us or forget us. It does happen. It is a part of it. And then it’s just paying attention and watching. What I love doing is trying to find moments and storytell without directing or being evasive. It’s just sitting on the floor and watching. Izzy: When we shot, we had a ton of footage. We were literally there for several days at a time. Except for a few hours where we had to sleep and shower and eat, we are with the families for the whole day. When you do that, rather than taking out the camera when “something special is happening,” by using more observational filming, filming all the time, blending with the background approach it is when the cuts count in the editing room because we have so much footage. It’s how we capture moments that we didn’t even realize were going to happen and get the families to realize we’re just there, just part of the furniture, instead of breaking out the camera like paparazzi at specific moments. That was something that we intended, when we decided on how we were going to shoot. One of the toughest things, I know it is for Paige, I know it is for me, there is a trick to it, too: you have to learn to be, in a respectful way, rude. You feel a little rude when you don’t engage with people. You don’t comment or ask questions, you don’t answer. Especially kids, they want to ask you everything. If you start engaging people, it becomes a reality T.V. show where people start talking to the camera all the time and making themselves conscious. One of the things we had to do every time we visit after saying our hellos and doing the social stuff, we had to slowly remind them, “Pretend we’re not here. We’re not going to comment. We’re not going to react. We’re not going to eat with you. We’re not going to drink with you.” That was tough because we liked these people, they liked us, and we have a relationship. At some point, we had to be almost rude in that we’re not going to engage; we’re just going to be inert, be furniture or objects. [AE]: Was it your decision to incorporate the still shots? Izzy: It was a collective decision from the get go. That’s why we had both videographers and still photography for everything. I’ve worked with Paige in the past in other short documentaries, and I knew that there is a method to the madness. Video is great for capturing the action and the activity. But sometimes, when you really want to capture the emotion of a moment, the sadness in a child’s eye or the joy in a mother’s face, those moments are captured best with still photography because it really captures the magic of the moment. [AE]: In those moments, when did you realize you were collecting some heavy material in the more quiet shots? Paige: You just know you’re in it. Like Izzy was saying, a lot of the time nothing is happening. Then when things do happen and we’re just built in, continuing to go. You know those moments. You feel it. For me and my editing process, it’s much easier than Izzy’s. I can filter out pretty quickly the ones I know are the moments that are important. Whereas the filmmaking… I’m still blown away by Izzy’s editing with how she pieces together the story and collects the moment. From my perspective, it’s been pretty easy. It’s just a matter of paying attention. Again, sitting on the floor, watching, and being quiet. Izzy: A lot of the decisions of when to use still photography or when to use videography ends up being made in the editing room. During shooting, we just shoot as much as we can, from as many different perspectives, not knowing how things would turn out in the edit room. Paige shoots away with still photography. There isn’t this big fight of: Now something’s happening. Now nothing’s happening. You just keep going when you’re there and leave it to the editor to wade through everything to figure out how to balance everything and make a story of it. I liken it Lego blocks when we’re shooting. We’re creating as many different Lego blocks we can, in as many different shapes and colors. Then afterwards, in the editing room, we put on another hat. We look at that crazy box of Legos and go, “What the hell am I doing?” In the end, you only use such a small portion of it, but in the editing room, the wealth of things you created on set allows you to figure out if you’re going to build a pirate boat or a spaceship or a carriage, whatever it is—that’s how our process is like. [AE]: When you’re addressing a topic of such a progressive and standard-challenging nature, your impulse probably seeks to promote the movement with your film. Did you anticipate that you might encounter situations in which your subjects were less-than-happy with their decision to structure their family this way? Izzy: Out of the families we followed, the one family that initially had the hardest time was probably the Seattle family. The idea of choice is a tricky topic because, yes, it is a choice, but it is a choice of necessity. When the woman’s job starts making more and the husband’s job starts making less and they look at the cost of childcare and compare it. While it’s a choice, it’s not, “We won! The guy is staying home because we want to stand for something!” It’s not from an activist perspective. It happened they’re making the best choices for their family, for themselves, for each of them, but not trying to make a stand one way or another, but they are being brave. Their choice is not about the Big Flip or not. Their choice is what is best for our family. What is best for my kids? What is best for my husband? What is best for my wife? His and her unique personalities and strengths? It turns out that circumstances in our society, the best choice is for the women to pursue her career and men to take more charge at home so she can do that and the kids know that there is someone at home to take care of them. [AE]: Did you feel they were hesitant to open up about the negative aspects when they reached that point in their lives? Izzy: The hesitancy comes more from: they want to be honest, but at the same time, they don’t want to be hurtful to their husband or their wife. You see that hesitancy comes more from. How honest can I be without it feeling like I’m ripping my husband or my wife apart? You might have noticed in Chip’s story, in the beginning, when we’re following him, people or friends will ask, “Why do you have two cameras, three cameras following you?” He will just go, “Oh, it’s some documentary,” and he’ll leave it at that. 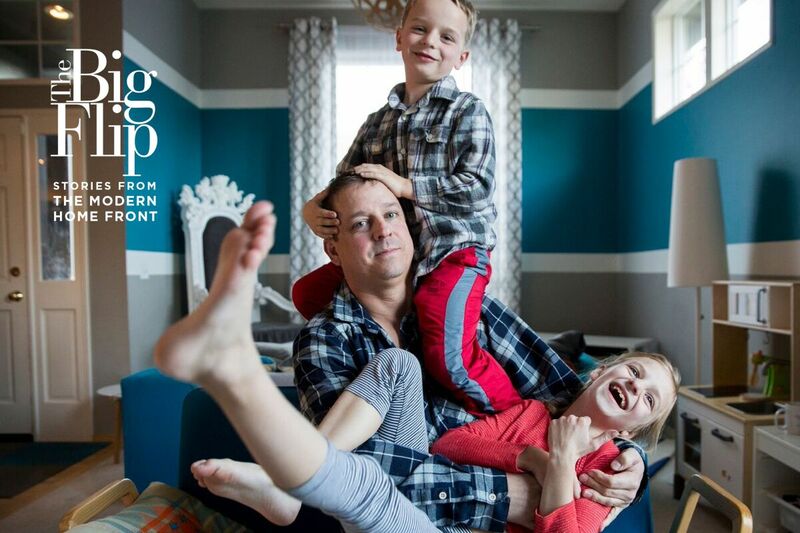 With families that are more comfortable, like Chuck, who will say, “They’re doing a documentary because my wife is the breadwinner, and I’m the one taking care of the kids.” They do have different levels of comfort. 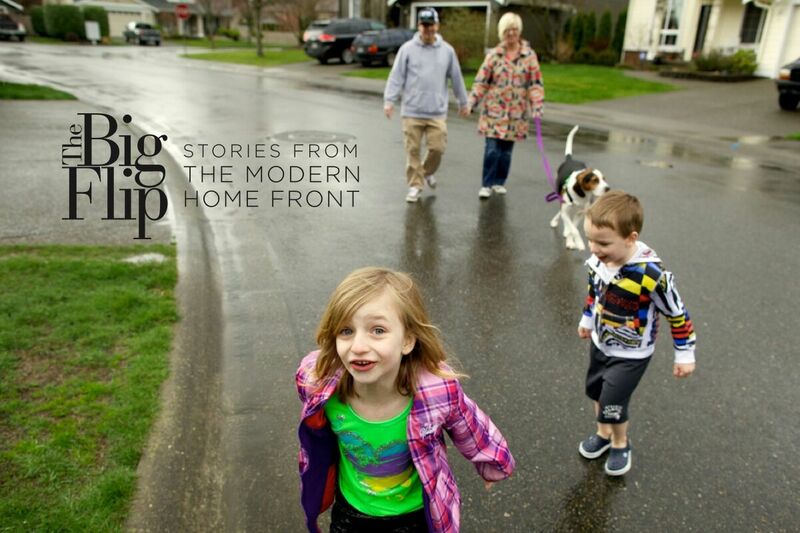 Chip did turn around; too bad the footage wasn’t clear in sound, but in the beginning, he would say, “Oh, some documentary about families,” and by the end of the shoot, there was one time he did say, “Oh, a documentary about stay-at-home dads. They’re following me because I’m a stay-at-home dad.” I remember Paige and I looked at each other, “He said it! He said those words.” His comfort level changed over the course of this film as well. [AE]: Expanding more on Chuck’s situation, was that a common occurrence? Did your presence draw a lot of attention and start these sorts of conversations? Paige: It was definitely regional. The reactions we had, depended on where we were. In some places, like Portland, it’s such a liberal, relaxed place, they’re used to it and okay with it. We had access and people didn’t really blink too much. In L.A., we had a lot of access issues. People were overly aware and sensitive and not giving us very much permission. Nashville and D.C. were a little more relaxed and curious. A lot of people in L.A. were thinking we were paparazzi and wanted to know who we were following. I thought that was funny. [AE]: The biggest take away for me after viewing this film was simply to start a conversation with anyone because it’s a societal shift we aim for. Do you find yourselves as advocates to bringing awareness to this new normal? [Izzy]: Definitely, I think that’s what we want to do, get more people aware and comfortable with it, to see the kids are fine, to see these families are like any other family where they care for kids, and yes, they have their moments like any other family. When people ask us, “Why do you think there is more friction and unhappiness and higher divorce rates in these families?” A big part of it is when, day in and day out, you have all of these social expectations that you are breaking and defying, it adds, day in and day out, to the sense of guilt and discomfort. It does add up to making life a little more difficult. If we could change the conversation, help promote more positive images of guys with their kids, help more working women and working moms feel like they’re being great moms or providers and that they shouldn’t have to feel guilty about that. Hopefully with all that, we can start changing some of the conversations and have the environment more amenable, less hostile for these families. [AE]: What actions do you see as necessary for change to expand? [Izzy]: One of the big things is for people to realize and see more of it. A lot of times change comes with awareness and education. Some of the negativity you see, in more conservative circles where they talk about a man not being able to take care of kids and that society is falling apart. But when you actually meet these families, can you really look at Ross or Chuck in the face and say, “You are a bad father. Your kids are going to turn out awful”? No, once you meet these people, once you see what they are doing, it makes you realize a lot of these unfounded fears that conservative folks have are just that, unfounded fears. Men, who want to, can be great parents and take care of their kids. When women are breadwinners, it doesn’t mean their children will be unhappy and neglected. By bringing more images of happy, healthy families where the dads are engaged and the moms are passionate about their careers and at the same time feel satisfied and happy with their family life, all of these will slowly shift. It’s all about making folks more aware and feel comfortable with this idea. [Paige]: I think businesses, schools, advertisements, everybody is shifting and realizing in the way of language that it’s not just the mother, we’re not just targeting moms. You can see the shift happening in advertising. There are more advertisements with men who are cleaning or taking care of the kids or doing laundry. It is happening and at school, they’re learning. I got called out at the preschool, they said, “We’ve never seen you here.” It’s that kind of misunderstanding. I’m not here because I’m working, I would love to be here, but there’s that conversation of taking the pressure off. Institutionally, it’s about making sure dads get enough paternity leave. I hope this shift happens and this dialogue gets louder. [AE]: There are many angels who made this project possible. Is there another campaign coming up to help spread the word? Izzy: Yes, there is, thank you for asking. We are so close to being finished, but making documentaries, is, as we’ve learned, very labor-intensive and very expensive. There are so many parts we are so grateful for all of the support we have. We have this final push to make the music happen and credit graphics happen and distribution. We made the film and now we need a way for people to see it. [AE]: This seems like a documentary with a lot of challenges, not the least of which is all the required traveling. As a crowd funded artist, can you speak toward the extra pressure of ensuring that you overcome these inhibitors to provide your donators the best possible film? Izzy: We had a lot of travels for all the different families, and that’s a part of what our first Kickstarter was, funding the production dollars of being in so many different cities. You probably are not aware of, we actually followed six families as a researcher and documentary filmmaker, the idea was to document enough interesting changes, and ended up being in the film. We were lucky that four did that. In the documentary, you don’t know what is going to happen in other people’s lives, you have to cast a little wider and know that out of that you end up having enough to tell a good story and enough differences amongst them. We had followed six families over 18 months for this. We self-funded a lot of it. The Kickstarter dollars started most of the production, and after that, a lot of the post-production, we self-funded. I did a lot of the editing myself, brought in editors, that was one big way we kept our budget tight. We’re in a stage now where we’ve exhausted every resource we have. We’re 99% there. The last big outstanding expense is music because all of the music you’ve heard is stuff we’ve found out there that sets the mood we want but cannot use. The best way to finish the film is to do second crowd-funding campaign, a music fund really, to get the music for the film so we could start putting it out. As much as we hate the idea of doing another crowd funding, all the hard work, the investments our current donors, we have a good product and we don’t want to shortchange it. We want to do it right and finish it promptly and give it the fair trial that it deserves, and when it gets out there, people can be proud and make the change that we want to make. [AE]: When does your new campaign officially launch? [Izzy]: Next Wednesday! We’re working hard on this. We tried everything we can to see if there are other ways to raise money. We’ve gotten pretty far in post-production, without having to do any other crowdfunding stuff, but next Wednesday! It’s going to be live and we’re going to be working hard to get it out there. Our goal is, we really don’t care what dollar amount people give, we just want as many people to come and raise their hands and fund it because it shows potential distribution; that there is an audience; that people want to see it. Our next big challenge once we get the music done, is trying to get to film festivals, talking to places like PBS and HBO Documentaries and whatnot to see who would carry the film. I think having a successful crowdfunding that has a large number of donors will help prove to potential distributors that there is an audience who want to see this film. 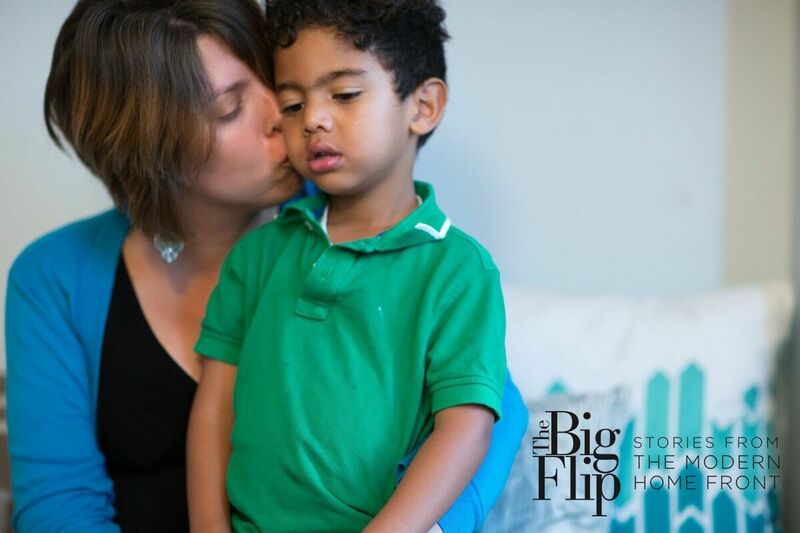 If you would like to support The Big Flip in its final stages of production, an Indiegogo campaign has been established to help the filmmakers buy the rights to soundtrack music, make a a round of final edits and finish the documentary.